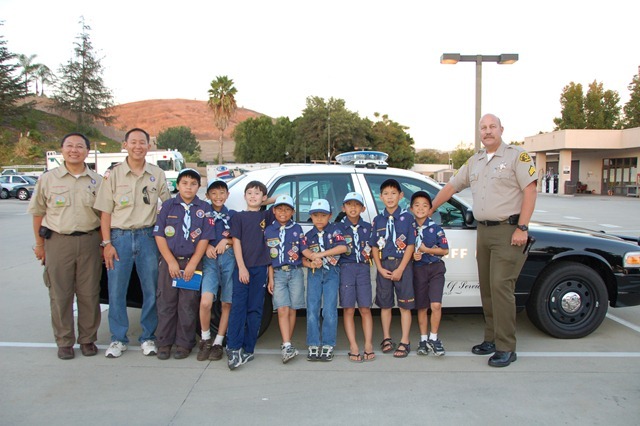 I took our scout troop to the Walnut sheriff station tonight and was given a very detailed tour of the station by Sgt. Saldecke. At the end of the tour, the kids asked what was in the basement. The Sgt. mentioned that his office was down there and I added, so is the DCS radio room. I then told him that I was part of DCS and he was quite complementary of the organization. He spoke of the importance of DCS and its role in support of the station and other DCS activities. He mentioned Keith and Lory and especially singled out Milton as being a really "great guy". The kids had a great time and it was cool to have the DCS connection. Attached is a picture of our visit. BTW for those that don’t know me, I’m second from the left.